The project area lies entirely within the Red Lake Indian Reservation. The site is approximately 30 miles to the east of Thief River Falls, MN, in Beltrami and Clearwater Counties. The drainage area above the dam is 82 square miles. 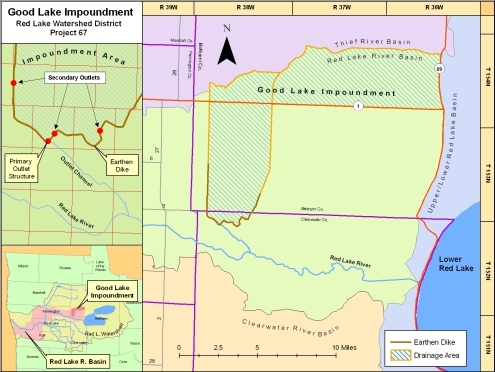 The Good Lake Impoundment Project 67 is designed as a multi-purpose project to provide wetland wildlife habitat, flood water retention, and a potential supply of water for irrigation. Fish and Wildlife: Enhanced wetland habitat for waterfow, furbearers, and other wetland species. The reservior can also provide an environment for the seasonal rearing of northern pike. Flood Control: The project will reduce flood peaks on both the Red Lake River and the Red river of the North. The dam will store runoff from the 73 square mile drainage area. Spring storage capacity is 11,300 acre-feet and is equal to 2.6 inches of runoff from the drainage area. The project will also reduce flooding on approximately 4,000 acres of private land immediately west of the project, by intercepting overland flow. Water Supply: The reservoir may be used as a water source for irrigation of wildrice paddies. Paddies have not been built, but there is potential for paddy development in adjacent areas. In late July, the operable screw gate on the outlet structure malfunctioned and came off the guide mechanism. About one month later, the pool was drained enough to do the repair work required. New angle iron guides and bracing were installed, and the screw gate was again closed. Independent Locomotive Services of Thief River Falls was hired to make the repairs. Staff from the Watershed District also assisted.